I was caught in the rain the day before and I woke up with a bad case of sore throat. So come lunch time, my staff asked what I would like to have lunch. Being in an unfamiliar place, I don't really know what is available and so I said to go for a light lunch and eat 清淡 a bit. Then he brought me to eat 麻辣炒锅. The set up is a bit like our Yong Tau Foo stall where you pick your ingredients and hand it over to them to cook for you. It's the same here as we picked black fungus, golden mushrooms, Foochow fishballs, veggies and some other stuff. We handed it over and their stir fry everything with lotsa lotsa 花椒 (Sichuan Pepper) and lotsa lotsa oil. 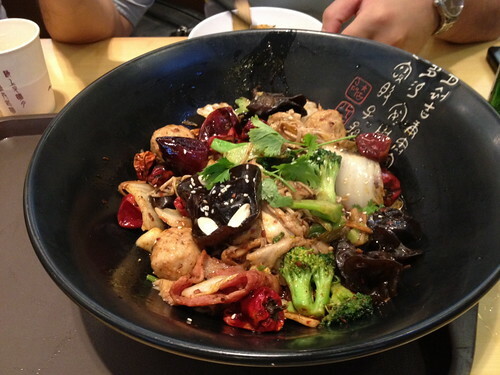 With this big bowl in the middle, we tucked into our individual rice bowls and devoured a very yummy lunch. Fortunately, my throats didn't get any worse after that.